Monitor Audio launches Monitor Series speaker range | What Hi-Fi? The new speaker range includes two bookshelf speakers, two floorstanders, a centre channel and a subwoofer. 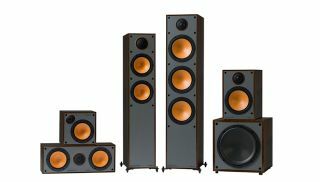 Monitor Audio has announced a new range of loudspeakers, called 'Monitor Series' (which is nothing if not an apt name). The range comprises two standmounting models (Monitor 50 and Monitor 100), two floorstanders (Monitor 200 and Monitor 300), a centre channel (Monitor C150) and a subwoofer (Monitor MRW-10). Starting with the smallest, the two standmounting speakers cost £160 (Monitor 50) and £200 (Monitor 100) per pair. Monitor 50 features a 13cm driver and 25mm C-CAM dome tweeter, with a single set of gold-plated terminals. Monitor 100, meanwhile, has a 16cm driver beneath the same tweeter, and two sets of terminals for optional biwiring. For something larger, you'll be looking to the floorstanding Monitor 200 (£400 per pair) or Monitor 300 (£550 per pair). The 200 is packing two 13cm drivers housed in separate chambers, which are accompanied by the same 25mm tweeter. The 300 model packs a larger punch: three 16cm drivers (two dedicated bass drivers and one for midrange frequencies) alongside that tweeter. Monitor Audio describes the 300 as a "true all-rounder". Centre channel duties in a home cinema arrangement fall to Monitor C150 (£140) - it features twin 13cm drivers - while low-end wallop is served by Monitor MRW-10 (£350). This subwoofer deploys a 25cm bass driver to delve down to 30Hz (Monitor Audio claims) and is powered by 100 watts of Class D amplification. These speakers are all available now, in black, white or walnut.